Spooky Frugal Halloween Fun! Mr.CBB’s Scary Witch Finger Cookies! Ding Dong the Witch is Dead! 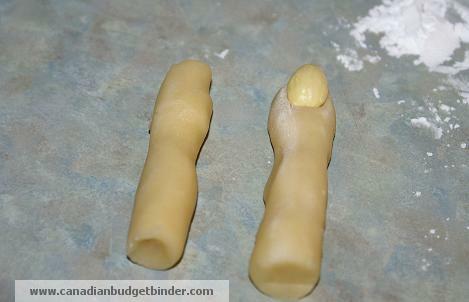 These Easy To Make Witch Finger Cookies Will Be A Hit For Your Halloween Party! Halloween is just around the corner and if you are looking for an easy cookie recipe that is fun and frugal you must make my scary Witch Finger Cookies. 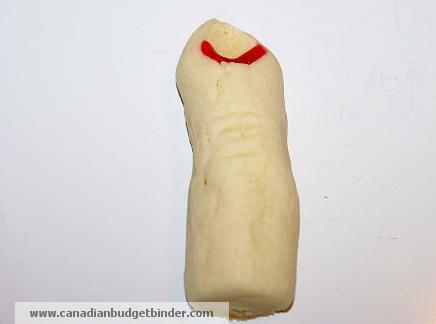 With so many Halloween parties happening in October this scary quick witch finger cookie recipe will be a hit for any party whether with your friends or co-workers. These are also great little treats to send with the kids to school or day care if they are permitted. 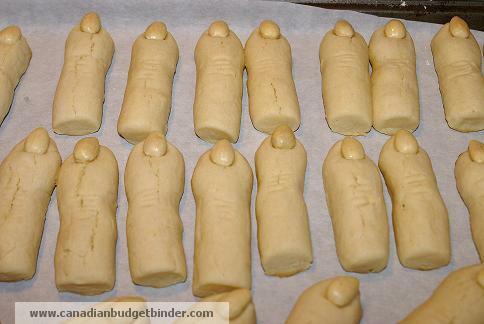 You can’t buy these witch finger cookies around where I live but they are so cheap to make. I would say all said and done not including time and hydro they cost us around $5.00 to make. That’s not bad for a yield of just over 36 witch finger cookies. The best part is the witch finger cookies are fun to make and making these with the kids, well you can’t buy memories can you now. The ingredients in these witch finger cookies start with basic ingredients although the almonds, almond and vanilla extract and red decorator gel are something you might have to head to a bulk store to pick up. Believe it or not the bulk barn actually the cheapest price on the almonds and decorator gel. If you can get your hands on the Spend $10 save $3.00 coupon it will make this recipe even cheaper to bake up which we did. 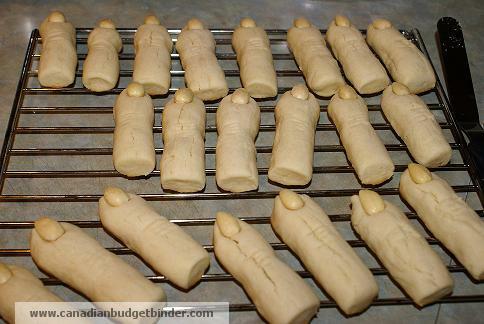 Mrs. CBB has made this simple witch finger cookies recipe at Halloween for about 10 years she says but she doesn’t recall where the original recipe came from. Back in the UK my mum would make cookies that were similar but not for Halloween just every day shortbread butter cookies. You could easily switch this recipe up for any occasion as long as you have a creative mind. The only changes she has made over the years is adding the almond extract flavouring. The original cookie had just the vanilla and it wasn’t tasty enough for her liking. You can find all sorts of variations of the witch finger recipe on the internet but mine is the best. If you want to add warts as soon as they come out from the oven simply press a chocolate chip into the witch finger. 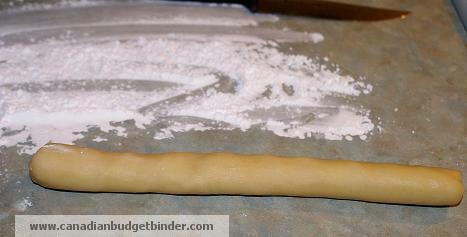 If you dislike almond extract try lemon or add in some orange, lemon or lime rind to the dough. Note: Sorry this is not printable as I created the post before I had my recipe plugin. You can copy paste it to WORD and print though. TIP: Cook for 7 minutes then check the bottom. If the bottom has browned pull them and move them to a rack to cool. If you over-cook these cookies they will get too hard. They may not look done on the top, but they are. In a mixing bowl or stand mixer add in your butter and mix until blended. Cut the first finger about 1.5 inches in length and use this as your cutting guide for the rest. Make sure you roll them thinner or they will turn out chubby like some of mine did. They do grow in the oven. Once you cut your fingers squeeze the top of the finger so the sides come in then press in your almond. Place on a greased baking sheet or like I did on parchment paper. Bake for 7-10 minutes but I check at the 7 minute mark. If the cookie is brown underneath, pull them out. Don’t wait for colour on top or the cookie will be too hard. With your decorator gel, remove the almond, squeeze some into the nail bed then replace the almond. 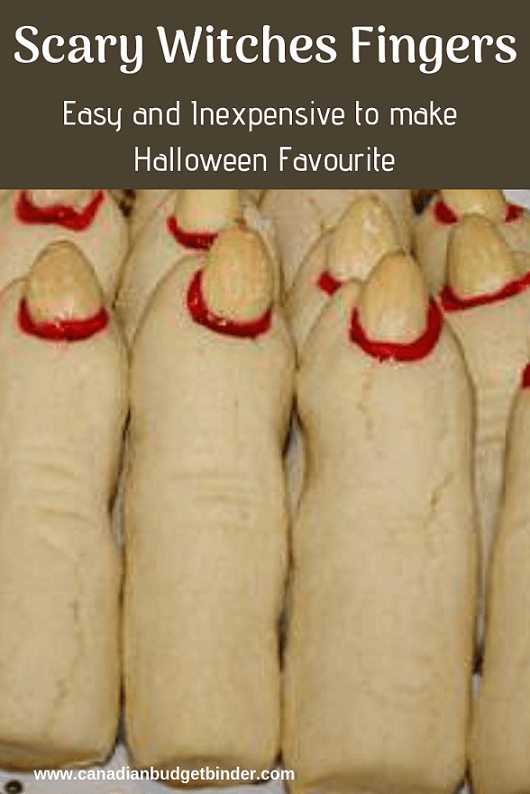 There you go, enjoy your Scary Witch Finger Cookies! Thanks.. and they taste so good, very light, hardly any sugar. These look repulsively scrumptious. LOL! Is that a paw nestled next to the caramel squares? Hey, I’m a bloke and they were super easy to make.. so pat on the back for Mr.CBB.. ah! Cheers Pawandeep!